Alright, so today's guest post from Matt over at Method To Your Money is about something that is near and dear to my heart. For those of you that have been following M$M from the beginning, you probably already know this, but when I originally started this site I wanted to use it to teach high school kids about money! When I was still a teacher, I started teaching my students little money lessons during their advisory period…and they freaking loved it. That's basically how I realized that I was passionate about/good at communicating with people about personal finance, and M$M was born. The blog got traction so quickly that I had to put those plans on the backburner, but it is something I'd really love to do someday. Teaching personal finance is unbelievably important, and it's still not integrated into every student's education. Patrick recently graduated from high school. During his 13 years of education, the primary focus was learning how to juggle, ride a unicycle, and master the tightrope. He can’t read or write, at least not well enough to do anything more than sign his name and read a few road signs. He knows almost nothing about history or science and he can’t do math to save his life. But he rides a mean unicycle…while juggling… on a tightrope. Unless you had circus in your blood, most people would agree that teaching kids in this fashion would be insane. Why would we spend 13 years of that poor kid’s life teaching him skills that aren’t even a tiny bit helpful in “the real world”. If you were his parent, you be filled with righteous anger at why your child wasn’t being taught what they needed to be successful when they graduate. And yet, that’s exactly the system we’ve designed for an overwhelming number of students who graduate today. Quick show of hands…how many of you took a class on basic personal finance in school? I did an informal Twitter poll. The results? 70% said they had not received even a SMALL amount of personal finance education during their school years. Not even in Math class. One possible explanation is that this lack of financial education is not a problem. Despite no formal teaching about money as they prepare to make some of the biggest financial choices of their lives, high school grads must be succeeding with money, right? Two of the most important financial decisions you’ll ever make generally happen in your 20’s: what are you going to do for your career and where are you going to live. How students handle these choices can dramatically impact their financial future. Going to college and racking up massive amounts of student loans on partially completed degrees, degrees with little or no return on investment, or degrees in things you hate but feel pressure to go into doesn’t make sense for anyone…except the colleges and universities requiring you to sell a kidney on the black market to pay your tuition. In the landmark personal finance book, The Millionaire Next Door, Thomas Stanley details the unlikely characteristics of the truly rich. What’s the most common profession of millionaires? Business owners and those who are self-employed. While some of these millionaires may have gone to college, many took non-traditional routes to success which did not include going to college or the 5 to 6 figures worth of debt that come with it. Despite having just taken on heavy levels of debt for the first time in their lives, and making an entry-level wage, the cultural pressure to buy a house is huge. The average first-time mortgage is nearly $200,000. So just to recap, in the 5-10 years after graduating from high school, many people will have taken on in the neighborhood of $300,000 in debt (not to mention $7,000 in credit card debt). No wonder personal finance fundamentals like “live on less than you make” and “invest 15% of your income” become difficult if not impossible to achieve. Surprisingly, the remedy for preventing financially illiterate high school graduates comes from…Whitney Houston. If we want to improve the state of affairs when it comes to people’s finances, we need to teach children to handle money better. This should not come as a shock to anyone. We know that if we want to teach someone to do something, generally the earlier they’re taught, the better. We generally don’t introduce people to reading when they’re 35. You can’t teach an old dog new tricks, but a new dog? Yup, they can learn. Eight years ago my beautiful fiance (now my wife) came to me and expressed that she wanted me to learn a bit more about personal finance. Doing so would make her feel more secure and help us manages our finances wisely. That conversation kickstarted me along my current path of learning and growing as much as I can when it comes to personal finance. Because I’m a teacher, I felt this insatiable need to share what I was learning with everyone around me. And because I spend 6 hours a day with kids, they were my unwitting victims, ahem, I mean pupils. As a Science teacher, my curriculum never really lent itself to teaching personal finance. Trying to relate student loan debt to how Igneous rock forms was always a bit of a stretch. A wider pool of parents who could potentially become angry at me. But I also was able to have influence over some of the programming at my school, which included developing my own course. Money, Money, Money (aka personal finance). I knew from my years of teaching that kids were really interested in money. Well, let me rephrase that; they were interested in being rich, which was why I called the class Money, Money, Money and not Personal Finance. All I had to do was hook them on the idea of being rich and use that as jumping off point for teaching them the basics of personal finance. If they were able to leave my class with a solid foundation, they’d be set up to crush it with their money in the future. In other words, without sounding shallow and materialistic, what would you do if you were rich? Some talked about giving the money away, and other dreamed of world travel. The highlight of the first class was describing to students how interest works. I told them that if they took the million dollars and invested it, they could make money while they slept. This boggled their minds and helped set the tone for the classes to follow. The course culminated by playing a game called Countdown To Retirement where students were forced to make basic financial decisions in a life simulator. It was awesome seeing them use their new found knowledge to weigh the pros and cons when it came to spending, investing, going into debt, and what type of career path they decided to take. For many of the students I teach, this is the first time they’ve ever had the chance to openly discuss money with an adult. Kids are growing up today thoroughly unprepared to face a world which is designed to eat them up and spit them out when it comes to money. Each and every day they are bombarded by messages of hyper-consumerism. The least we can do is give them the tools they need in order to navigate this scary place we call adulthood. And the irony is, it’s really not that hard. 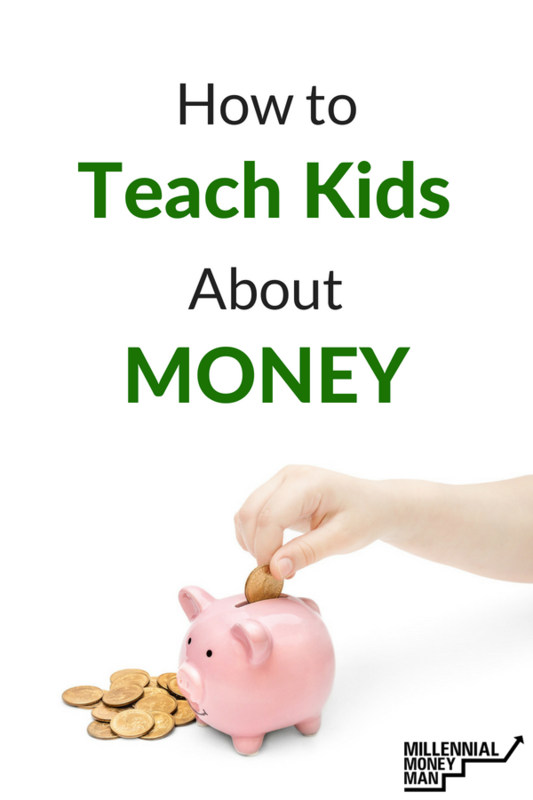 You don’t have to be a teacher or a personal finance geek to teach kids about money. Talk with your kids about money – Parents might think about how they’re going to talk to their kids about the birds and the bees, but they often have no clue how to bring up money. One of the best things you can do? Simply talk openly about money. Whether it’s sharing how you pay the bills, discussing how you’re hoping for a raise at work, or explaining why you give money to the less fortunate, make money-talk normal in your household. Your kids will learn so much more than you have time to teach them. Teach them to work – Our 2-year-old is a little young to be working for his keep (just by a few months or so) but our 5-year-old knows the score in our house when it comes to making money: You work, you get paid. You don’t, you don’t. She has a list of 7 chores that we expect her to do each day. They’re things like making her bed and putting away her dishes. At the end of the week, she gets paid for what’s she done, $1.50 if they’re all complete (you may think I’m cheap…I prefer to think of myself as a valuist). We really want her to make the connection that work = money. The last thing I want is her developing an attitude of entitlement. Teach them to handle money well – It’s not enough to just GIVE your kids money when they work, you need to SHOW them how to handle it well. We’ve given our daughter 3 labeled jars which my wife has beautifully decorated. The first is Give, next is Save, and the final one is labeled Spend. Each payday she puts 1 quarter in Give, 3 in Save, and 2 in Spend. We’re intentional about teaching her to give first, save next, and spend last, with the hope that we’re ingraining a pay yourself first attitude and growing her giving and saving muscles. Teach them to invest – Compound interest is powerful. Crazy powerful. Like insanely powerful!! I’ve run the numbers for our daughter if she were to start investing at 5 how much she would have at 55. It’s nuts. Talk to your kids about this. They may not get the math. They can, however, learn to understand that a dollar today is worth way more down the line. Learn from your mistakes – Money can be scary for kids and adults alike. It’s important that parents teach their kids to have a growth mindset about money. Mistakes are not catastrophes. Rather, they are valuable opportunities to learn and grow. More is caught than taught – There is nothing more powerful than modeling great behavior to your kids when it comes to handling money well. When they see you choosing to spend your money in an intentional way or to save consistently, this has an incredible impact. On the other hand, if we’re living above our means and spending like it’s 1999, it’s tough to teach our kids to exercise self-restraint. If we hope to give kids a fighting chance when they grow up, they need to learn the basics when it comes to personal finances. As the adults in their lives, it’s our responsibility to pass on the financial knowledge that has worked for us. Some of this should come from classes that students take in school and some from parents being intentional about teaching money skills at home. As with anytime massive societal change is needed, we need to focus on reshaping the hearts and minds of kids. If we succeed at that, we’ll succeed at producing large-scale and lasting change. And they won’t be living in our basements until they’re 45. Did you learn anything about money in school? Did you design a class or was this a class that was available from a ciriculum source? I designed it. Nothing by in the formal curriculum that covers this, but I was able to develop it as part of the Career/Technology portion of the general curriculum. We talk to our boys about choices in how we spend money. For example, they will ask if we can eat out for lunch. When I say no, they want to know why. I say we are choosing to eat at home and save money so we can spend it on other fun things we want. Like vacations, going to the zoo, etc. It helps reassure them that we are not poor, just that we only have so much money to do what we want. We need to spend it wisely. I love it!! That is exactly what we do. We tell them the could totally eat out but we are choosing to spend our money elsewhere. So important for them to realize money is a finite resource and saying no to something can mean saying yes to something better!! I work in the Higher Education department with college students and I see all of the time college students who were never taught basic financial literacy principles make financial mistakes that will follow them the rest of their lives. It starts in the home and it starts in high school. Thank you for sharing your passion for why you started this blog in the first place. Keep up the good work! Thanks for the encouragement. Completely agree that it needs to start in the home. Parents are by far the most important teachers. School should ideally support what’s happening at home. As a teacher, I know that unfortunately this isn’t always the case. Teaching itbin school is so vital, especially for those kids who didn’t receive the basics at home!! I don’t remember if it was in high school or college that I first saw a presentation of the “magic of compound interest.” I will say that once I saw it, my life was changed. Making money work for me was the key goal and using that lens to frame spending really changes one’s behavior. That one thing can change the whole outlook of a person. So powerful! This is awesome Matt – you should be proud. I had no money classes in high school, and took one elective class in college. It covered the basics only but it was extremely helpful. It was paramount to me wanting to get out of debt, pay off my car loan ASAP, and generally save more than I knew my peers were. I still didn’t save ‘enough’ (or rather, as much as I know I could have) but that’s okay, I got myself into a lot better position than I could have been in. I think at least some fundamentals should be taught in high school. I think that students are totally unprepared to understand the true impacts of student loans or if college is even the best idea for them. Thanks for the compliments and encouragement. That’s awesome you were able to take an elective in college but I totally agree it needs to be taught WAY earlier.